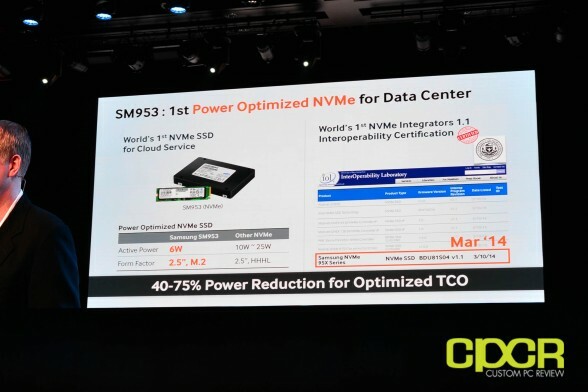 Here at the 2014 Samsung SSD Summit in Seoul, Korea, Samsung had an entire room filled with SSDs to show off – one of which caught our eye. Labeled as the Samsung SM953, this M.2 22110 (22×110) form factor drive carries a capacity of 480GB and maximum performance of up to 1,800 MB/s reads. For those familiar with Samsung’s M.2 lineup, currently the only Samsung M.2 drive we know about is client oriented Samsung’s XP941, which can achieve a slightly lower maximum performance of 1,400 MB/s. Unfortunately, there’s very little additional information on the drive such as controller or NAND however, given that this drive is in Samsung’s SM series lineup and that it has onboard power loss protection, it’s an OEM/enterprise drive that most of us probably won’t get our hands on anytime soon. During Samsung VP of Memory Marketing, Jim Elliot’s presentation on Samsung SSD Leadership, he presented a slide further showcasing the Samsung SM953. 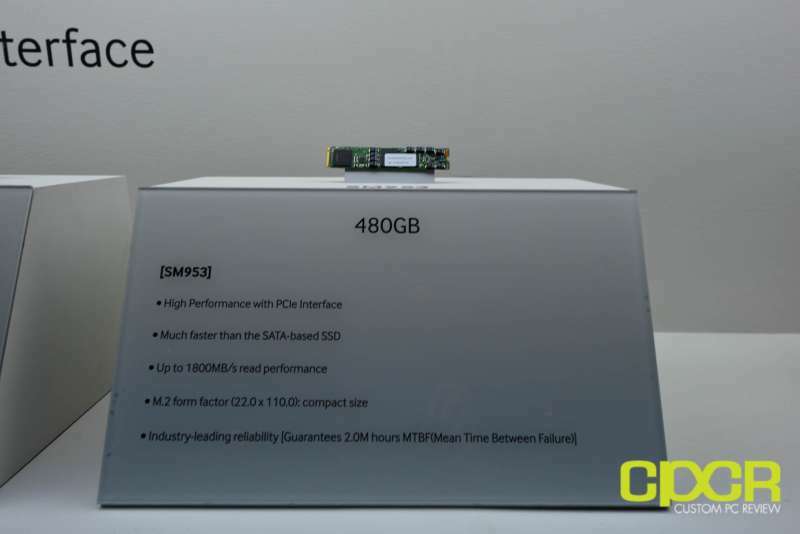 While details on the controller and NAND weren’t available, the SM953 was being touted as the 1st power optimized NVMe SSD aimed at the datacenter with an active power consumption requirement of only 6w – significantly less than most other NVMe drives currently based on the HHHL (Half Height, Half Length) design. This also confirms our initial notion that the SM953 would be an enterprise SSD. Further, the SM953 is already confirmed to be NVMe compatible and has already been certified by University of New Hampshire’s InterOperability Laboratory.